Ever since I saw a Pyrex Flameware teapot I have been in love. I have only seen them in person at a local antique mall and it was way over my price point. So I have been hopelessly hoping I would run across one at a thrift. No luck. When I visited my brother last month the rental house we stayed at at one. I so wanted to steal it but I did the right thing and left it there. One day I knew I would find one just for me. Today was the montly antique market here. Some of the items I saw were complete gooseberry freebie set (2 of them). Racks and racks of clothing. 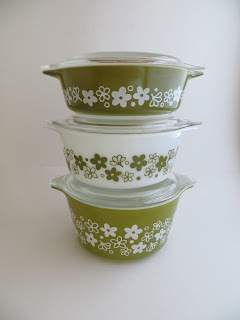 Various depression glass. And anything really you could be looking for. I went by myself this time. Got through the whole thing in an hour and a half. I was looking for certain things or I could of been there all day long. I said no to a $20 telephone table. $20 pink Daisy 045. $15 snowflake space saver, no lid. $120 lamp of grapes. I did however find the 471 Spring blossom cinderlla casserole to complete my set. Picked it up for cheap from the same man I got the Early American 503 form last month. On the same table he had a 045 Golden Rose with lid. I actually didn't even know what the name was when I bought it. There are so many Golden names they are hard to keep track of. Came home and figured it out. Then I was about to leave and noticed there was a stray isle I missed. I thought, what the hell, why not. So I started walking. Then I heard "Yuuuppp". I was startled and confused for a moment at the loud noise. I heard it again. "Yuuuuuuuuppppp." I looked to my left. And in my face was Dave Hester. Name sound familiar? Yeah the annoying guy for storage wars. He had a booth there. And what what did he have at his packed booth? 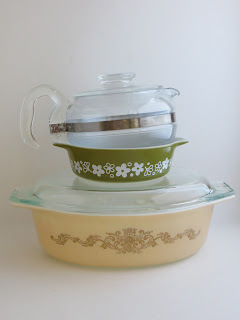 A pyrex tea pot! I asked his girl how much. She took the tea pot and went to ask. Dave turned around and said "$15". I of course countered with $13. He looked at me like who is she trying to haggle with me. He said "I told someone earlier $25." I looked at him with my sassy pulled back hair perfectly done, bright eyes and said "we'll I wasn't here then, so I don't know that for sure". He said. "Let's start over $25". Me: "$13." He laughed. Needless to say it came home with me for $15. I should of asked for a picture of us with it. To late now. Small but great scores of the day. He isn't as obnoxious in real life. Actually he is a nice guy. And his prices reasonable. My first ever semi celebrity meeting. Check another set competed off. 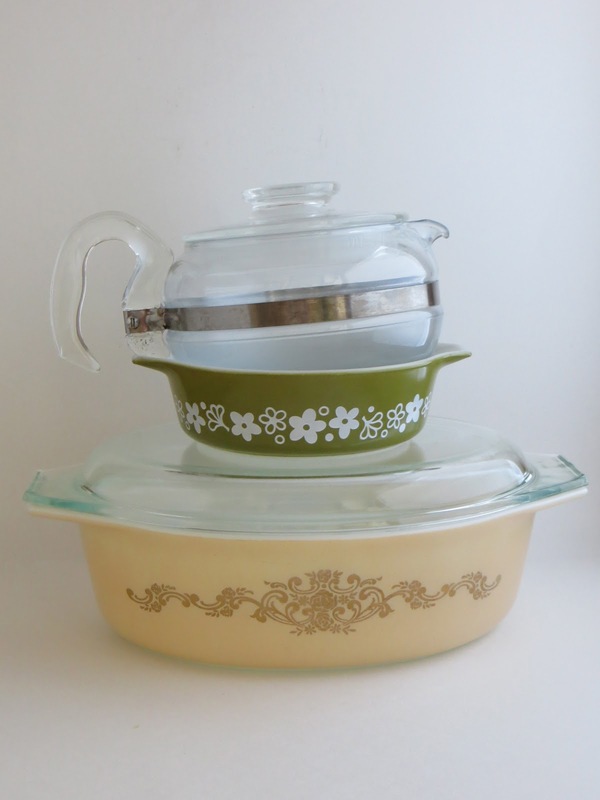 How exciting - your teapot will be your most famous piece of Pyrex!! !